The packaging is quite simple, the box is printed thin cardboard. The back of the box does give some steeping directions and Stassen suggests using “fresh boiling water” and infusing the tea for 3 minutes if you’re making a pot and 2 minutes if you’re making a cup. There are no recommendations on how many tea bags to use for a pot, so that part may be trial and error on the user’s end. 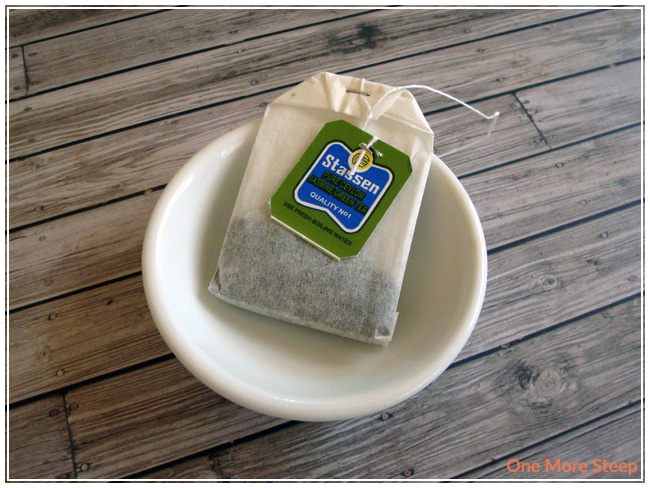 Stassen’s teas are from Sri Lanka and it is a pure Ceylon tea. According to the ingredients, this tea is made of green tea and artificial jasmine flavour. I appreciate a clean box design. The sachets are packaged 25 sachets in a clear, sealed plastic bag. Unfortunately, the plastic bags are not resealable so it is a bit harder to keep the tea fresher. The box is divided inside so each bag gets it’s own home. I would recommend storing the open bags in a plastic bag that can be zipped to prevent the tea from going stale and to prolong its shelf life. When opening the bag, I don’t get the instant floral scent in my nose from the jasmine flowers. It isn’t until I pull out a tea bag that I really begin to get a sense of the jasmine scent. While I do enjoy a good cup of jasmine green tea, it didn’t make me anticipate a really good cup of tea. Following the suggestions for steeping, I used water from the kettle as soon as it was done boiling and I steeped for about 2 minutes. I use straight tap water that gets boiled – the tap water where I live is safe to drink without additional treatment or filters. It definitely smells better after steeping than it did when the sachet was dry. The jasmine scent comes across much better following the 2 minutes of recommended steeping time. This jasmine green tea does not have any sweet notes to it and honestly it does have a slight bitter flavour to it, like green tea sometimes gets when it’s been steeped with water that was too hot. The bitter taste comes at the end of each sip, like an after thought. 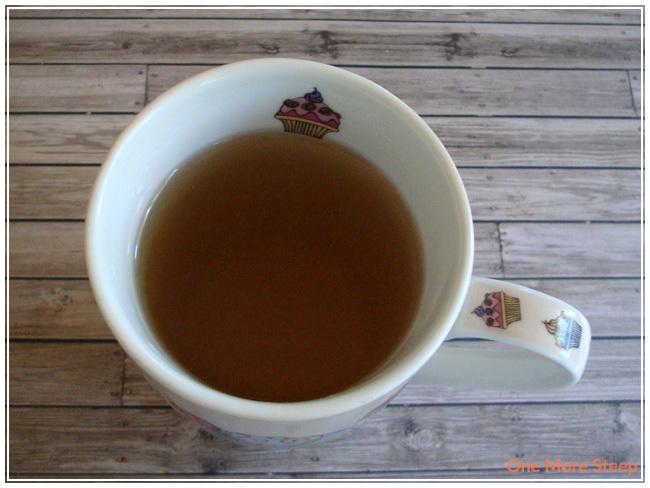 It’s not a remarkable jasmine green tea, or a remarkable green tea for that matter – it doesn’t stand out for me on first or second sip because it’s a fairly average green tea. Overall I do find it to be palatable – I find it nicer to drink when hot than when it has cooled down. Once it’s cooled down, the bitter flavour comes across more easily. It makes a very good hot drink though. I used the same tea bag for one more steep – again with “fresh boiling water” and steeping time of 2 minutes. It is remarkably better! The slight bitter after notes to the flavour of the tea is no longer present and while the overall jasmine scent isn’t as noticeable, my overall impression of the tea is much better. Perhaps in the future I might toss the first cup and go straight for the second steeping, or disregard the recommendation of using boiling water and go for a more suitable water temperature for this tea. 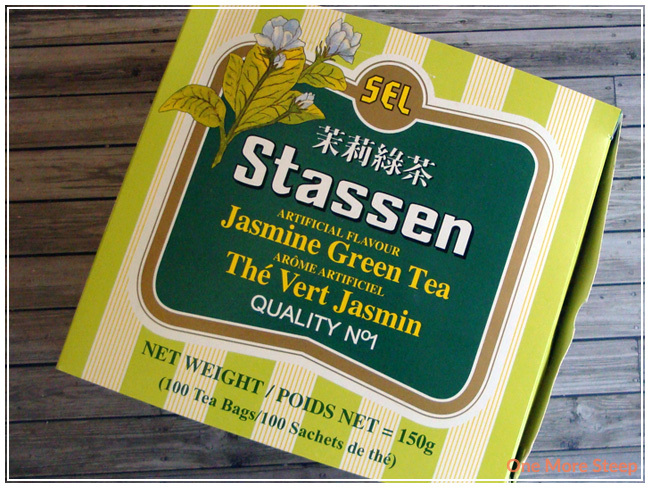 I liked Stassen’s Jasmine Green Tea. Despite having artificial flavouring, I would have given it four out of four cups if the first cup of tea had been better. It is certainly an affordable tea at 100 sachets per box (works out to $0.06 per sachet), and does make a decent cup of green tea. While it’s not a ‘stand out’ for me, for an every day budget friendly tea drawer staple, it fits the bill. Welcome to One More Steep! Can you tell me what the artificial Jasmine flavoring is made of – chemicals, herbs, ???? Thank you. It is delicious, but I want to know what I am putting in our bodies. Hello! I would recommend directing that question to Stassen 🙂 They will be able to help you out a bit more. It’s artificial, no doubt. I just tried it and it is just to much , it’s like it’s potpourri. It actually leaves a coating in your mouth. Just my opinion, had I known, I would not of bought it.